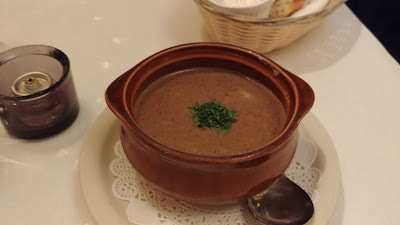 Soup du Jour, Mushroom Soup. I tried a few bites and liked it more than most mushroom soups. It was mushroomy, but not earthy mushroomy, if that makes any sense. Sometimes mushroom soup tastes too earthy/dirt like to me. But not this one. Yummy. 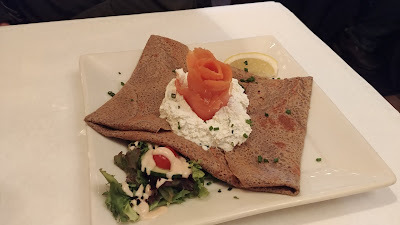 SP chose the Champs de Mars Savory Buckwheat Crepe (smoked salmon, dill creme fraiche, Swiss). He said it was delicious. I chose Quiche Lorraine (bacon, Swiss). 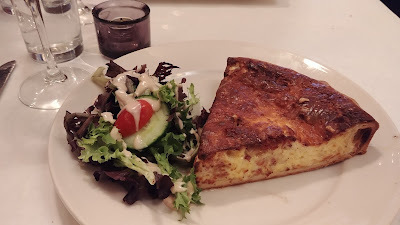 It was a big slice of quiche and filled me up. It was really good. The crust was thin and flaky and just so darn good. We didn't need dessert. We were full enough. And certainly our house is a bit too well stocked with holiday cookies, candies, chips, and all sorts of other snacks. 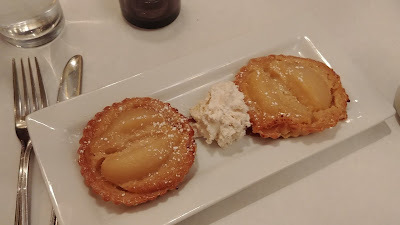 But, it was a French place, with French pastries, and there was no resisting the Pear & Almond Tart. So. Yummy. Warm, flaky crust, soft pears, smooth almond. We shared, but I'm pretty sure I could have eaten the entire order myself. We enjoyed our lunch at Paris 66 a lot. 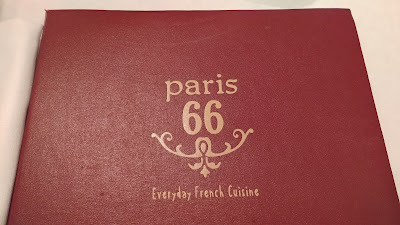 It was relaxing, yummy, our server was lovely - it made us wonder why it has taken so long for us to return. We made a resolution to return sooner rather than much later.